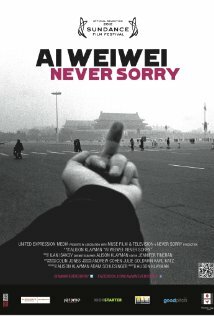 The other night I watched Ai Weiwei: Never Sorry at Toronto’s Hot Docs festival, and I was charmed. Both by your work and by you. To put it simply, you have balls the size of melons and the kind of youthful, rabble-rousing spark that makes me weak at the knees. Likewise, your art is courageous and purposeful, but also wry and full of wit. Never Sorry is loosely structured around the preparation for two of your major exhibits — a 2009 Munich show, So Sorry, and Sunflower Seeds, the 2010 installation at London’s Tate Modern. At the beginning of the film you mention that you don’t really know what you are going to create for either. Artists block? No. As the film unfolds, you reveal a remarkable, tenacious process for creating significant pieces based on the cultural, personal and political influences that you care about. What you ended up creating was incredible. 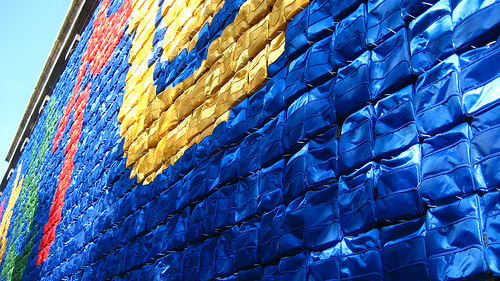 For example, the marquis installation for So Sorry was a piece called Remembering, made of 9,000 colourful, child-sized backpacks tiled across the front of Munich’s Haus der Kunst. There is something seductive about the piece — it has poppy colours and the backpacks are cute. It’s art that has a basic aesthetic value and that draws people in. But the deeper meaning is both haunting and clear: the backpacks represent myriad young live lost in the 2008 Sichuan earthquake — lives that might not have been lost if their schools hadn’t been built with shoddy, so-called “tofu” construction. Remembering wasn’t just a piece that you cleverly dreamt up in a far away Beijing studio. You exhaustively researched the earthquake’s devastation — documenting it with photos, blog posts and tweets. The images you snapped of strewn, debris-covered backpacks in Sichuan will stay with me for a long time, as will the names and birthdays of the young departed that you posted on your studio wall. It took a lot of bravery to do this research. Your blog was shut down and you were intimidated by police. But it takes a lot of bravery to do what you do on a daily basis — living with such a high degree of openness. Having a voice. That’s terrifying for most people, even those who don’t live in a strict, undemocratic country. Yet your voice is very well honed. You’re an adept communicator, who can distill and disseminate complex messages in easy-to-understand bites — one liners that satisfy like richly detailed novel. And you do it with so many different media: sculpture, photography, film, Twitter, blogging, architecture. You’ve been called Beijing’s Andy Warhol, a reference that I can appreciate for your entrepreneurial zeal, collaborative approach and catchy pop sensibilities. But I wonder if your work might ultimately be more compelling, because there is a sharpness and a purpose to the message. Ai Weiwei's Sunflowers. Photo by racoles. 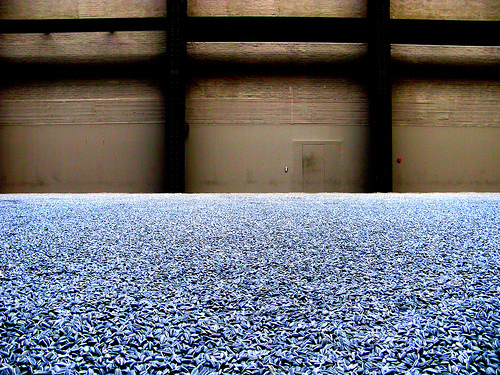 Sunflower Seeds, for example, is beautiful to look at — 100,000,000 million, hand-painted ceramic seeds laid in the Tate Modern’s Turbine Hall. It’s also layered with meaning: Mao used to depict himself as a radiating sun surrounded by sunflowers; to produce the work, a village-worth of people in China was employed to manufacture the seeds; art-loving Brits and well-heeled tourists were allowed to walk all over the piece (until it was determined the seeds let off a toxic dust when disturbed). Never Sorry takes a frightening turn when you are arrested and held in secret for close to three months. You are out of prison now but heavily monitored. You aren’t supposed to give interviews, but have been (including recently to CBC’s Q) Far from being never sorry, I hope your voice is never silenced. It would be a loss to art and the world. Oh, and P.S., you’re also hot because you’re a bit of a mama’s boy and your mom’s adorable. This entry was posted in Broad Strokes and tagged Ai Weiwei, Ai Weiwei: Never Sorry, Art, Beijing, CBC, China, Haus der Kunst, Hot Docs, Jeff Koons, London, Munich, Remembering, Sunflower Seeds, Tate Modern, The New Yorker, Toronto, Twitter by mmhague. Bookmark the permalink.